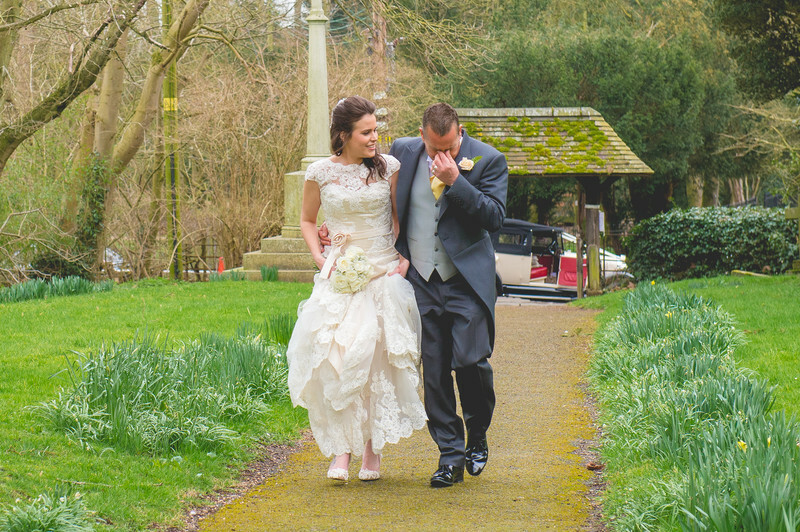 Ashley and Lydia got married at Kempsey Church in Worcester. Kempsey Church is a beautiful 12th century church a few miles outside of Worcester, and whilst it's only a mile from a main road, it backs onto hundreds of acres of open Worcestershire countryside and is perfectly quiet thanks to it's secluded location. I've worked at Kempsey Church many times over my career, and have even gotten to know some of the staff there quite well. Most recently I had the pleasure of photographing the Christening of Ashley and Lydia's little girl, Aurora. This photo shows Lydia and her father arriving at the church for the start of the wedding. I had spent all morning with Lydia and her bridal party, and had gotten to know her father too. He seemed happy, confident, and not at all the type of person I'd expect to show such emotion whilst walking his daughter to the church for her wedding. I think this surprised Lydia too, as you can see her reaction here - that big smile and a look of surprise! One of the things I love about Kempsey church is the walk from the road to the church is so often lined with flowers, and you can see here that the daffodils are just starting to come through at the break of spring. This creates a wonderful leading line in images, and helps frame the subject in the image. I made sure that for this photo I moved slightly to one side in order that I could capture the wedding car in the back of the image too. 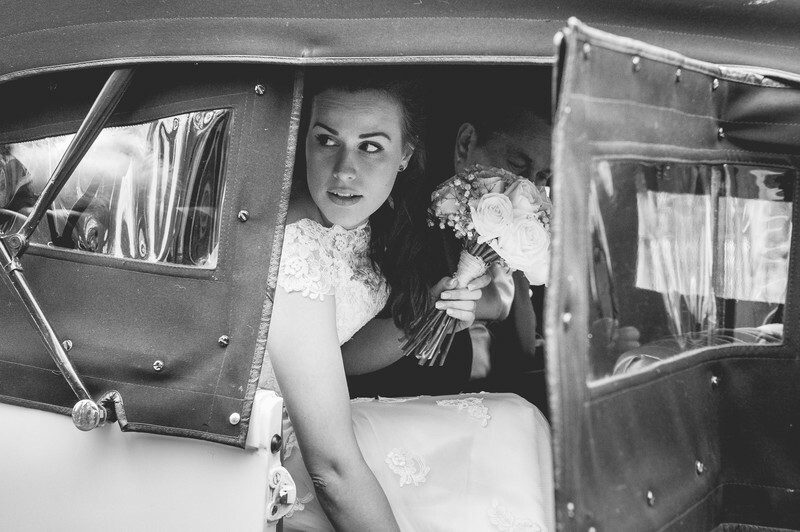 The car had pulled up so close to the church gates, it made taking a photo with the whole car in impossible, but it did mean I could get this stunning shot of Lydia getting out of the car on her arrival. This photo may be a few years old now, and it's not edited in the same way as I currently edit my black and white images, but it's still a firm favourite of mine, and has featured in my portfolio since the day it was delivered to the client. 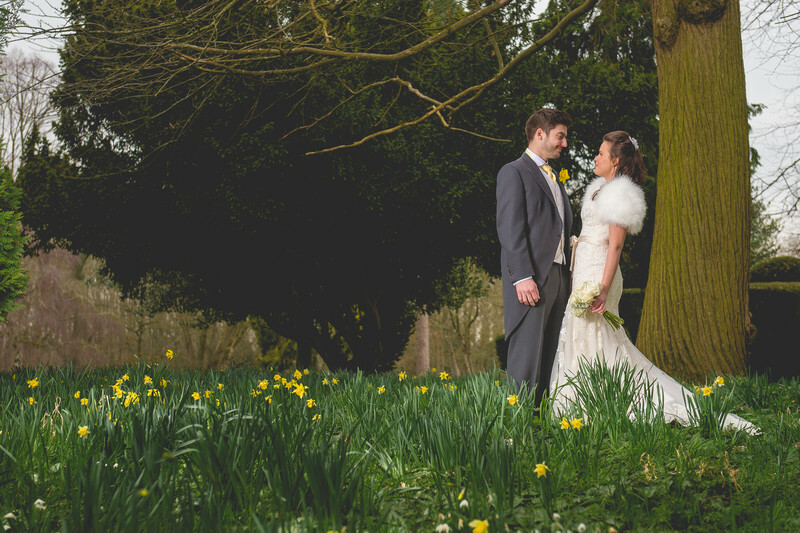 After their wedding at Kempsey Church, the bride and groom led their wedding guests to The Nash, just a mile or so down the road, where they hosted their wedding reception.